A guest post I wrote on overcoming depression in the StayFoolish blog. How to overcome suicidal behaviour & self-destruction? This question is so deep that one could write a series of books to answer it, and still have much more left to say. Many people including artists, thinkers and scholars have suffered from this condition, and many have succumbed to it. Sylvia Plath, Virginia Woolf, David Foster Wallace, Ned Vizzini are some names that come to mind – their books give us an idea of their struggle. Many have also survived the condition, and thrived afterwards in their personal and professional lives, a good example is J K Rowling; anyone who has been depressed can relate to the description of dementors – her metaphor for depression in the Harry Potter books. Depression is not the same as sadness. To quote Barbara Kingsolver, “Sadness is more or less like a head cold- with patience, it passes. Depression is like cancer.” It is much more of a challenge to diagnose and manage, as depressed people may not show external symptoms of the disease. A number of factors may trigger suicidal depression in an individual – it could happen in a short period as a response to a stressful or traumatic event, or build up as a result of spending many years in a debilitating environment. It could happen due to substance abuse or it could be the side effect of a medical condition such as hypothyroidism. Very often it is the high achievers in life, intelligent, creative and driven individuals who are affected by this condition. They may end up spending years without realising that something is wrong with their state of mind. Their professional expertise and inherent smartness might help them go about their everyday life and work, while they try to suppress the numbness within, unable to understand why they feel so. In all cases, the first step to overcoming suicidal depression is to become aware of it, to understand that they have a condition that needs to be looked into, and which can be controlled. The next step would be to get help, to discuss the condition with close family and friends for support, and seek medical attention, preferably holistic natural treatments that get the mind, body and spirit back in balance. Depression is a curious condition. Only the affected person can gauge what works for them, and what does not, and in spite of it being widely prevalent in present times, it is nearly impossible to make a generalisation. But however bad it is, as someone who has been there, I would say that it is worth to keep going, for eventually you will get to the light at the end of the tunnel. First, let us look at basic strategies. Find out a reason, any reason, to hold on to life, when you are in the throes of deep depression and cannot see ahead. When I was depressed, besides the many books that sustained me, strangest things kept me holding on to life. At that time I was working in a place that I disliked intensely, I kept going on because I did not want to die in that godforsaken place. Then I had a rather unpleasant acquaintance in those days, a woman who loved and lived to gossip, who had not spared making jest of her best friend when he died. I imagined how she would react to the news of my death, how she would relish it like a juicy morsel over teatime conversation, eyes bright with malice, flashing her smug toothy smile. When I was really down and wanted out, the thought that I did not want to end up as a source of gossip to the likes of her, kept me alive. Later, I had fun immortalising her in the character of the mosquito woman in The Reengineers. Once you become aware of the condition and are on the way to recovery, the most effective way out is to determine your major goals in life, whatever they are. Focusing on your goals, visualising them and working towards them is one of the most effective cures for depression, I say this again from personal experience. 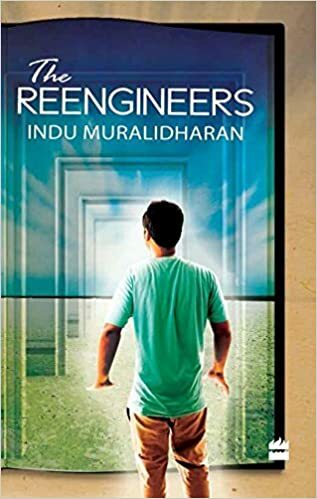 Here is a short excerpt from ‘The Reengineers’ in this context, in which the author Siddharth advises his hero Chinmay on how to survive while depressed. I found treasures in that library that sustained me through my dark days and, once, saved my life. The darkness had almost got me for good, one weekend. I drove to the library in a daze. Wandering uneasily between bookshelves, I pulled out a small book that caught my eye. Songs of the Bulbul by A. Chatterjee. It was a handsome book, dark blue and edged with shining gold. I had read rave reviews about it along with excerpts when I was a precocious ten-year-old in a Madras school. The book made me feel safe and warm as I held it, for it held the memories of a time when everything had been right in my world. When I now think of the moment I opened the book and turned to the first page, lo, my mind floods with light. For the next few days, the bulbul carried me on its wings, whispering to me though its songs that I was not alone in my sorrow. There had been other books that affected me. I had shrunk back from the darkness that leapt out at me from the yellowing pages of The Driver’s Seat. Sylvia Plath’s poems terrified me so much that it was years after I was out of the bell jar before I dared to open it. Chatterjee, on the other hand, acknowledged the darkness and even made fun of it. It was apparent from his verse that he had been touched by depression. Yet, instead of allowing it to take over his life, he opened the windows and asked it to find its way out. Undaunted by depression, he sang odes to the simple pleasures of life: the breeze that carried with it the fragrance of the flowers of the night, a litter of fox cubs playing by a hill in the sunshine, a toast to the moon with a glass of red wine, a raga hummed under the breath, a prayer for Mozart, a passion for mangoes, the love shared with his lost lover for Rumi’s poetry. His gentle songs were irresistible concoctions of life, art, nature, love, laughter and a tinge of pain, verse which had the power of claiming the reader as its own. To read him was like having someone listen to you while walking by your side. For years I held on to A. Chatterjee’s poems as a lifeline. I even had a crush on him for a while. 1) Read all that you can, including the online depression forums. Something that you read may just save your life. 2) Avoid hard-core philosophy. You might be tempted to seek answers in thick, dusty tomes that promise to elucidate the meaning of life. Some of them are thick enough to crack the mind. 3) Depression will stir you to burst into the poetry of suffering. Avoid trying to get it published unless your words are bright enough to shine through the darkness. There is enough pain in the world without you adding to it. 4) You may find yourself gravitating to amateur poetry groups full of people who are usually bursting with self-congratulation or angst. Avoid them, they will sap your energy. 5) Do not smoke, drink alcohol in excess or take drugs. Depression can tempt you to overindulge. The cigarettes almost killed me. 6) Exercise when you can, take long walks and consume chocolate in moderation. 7) Beware of ‘god men’ and ‘god women’. Even people who have not been depressed for a day in their lives get sucked into the seductive delusion of spirituality. If you must seek, seek by yourself, sitting in an armchair at your desk after office hours. For while Buddha saw the light, we do not know how many of his disciples did. If you must get guidance from a living guru, take it and move on. Gurus are no more than the teachers we had at school. You may find them when you need to learn, but you have to outgrow them in order to grow. Here is a story about my tryst with a genuine guru during my last few months of depression.